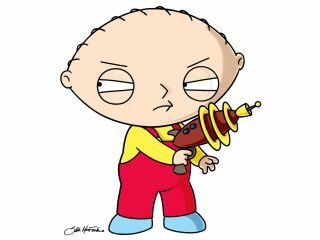 Family Guy's Stewie - suspect? A new way of buying a lethal weapon came to light in Germany recently, when a couple who bought a pram through an online auction site found a loaded Sig Sauer in the side pocket. The couple, from Verden, not only found the weapon but realised that the pistol contained six bullets. It has not been revealed if the weapon has been linked to any crimes. Although police duly searched the house of the seller for evidence of more weaponry, none was found. And inevitably the 39-year-old insisted that he had no idea of how the 9MM gun found its way into the stroller. TechRadar has ascertained that Family Guy’s Stewie and Omen’s Damien top the list of babies that the German police would like to question.